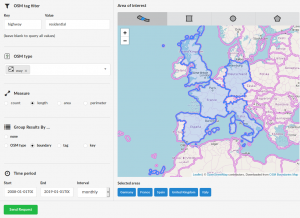 We, the Big Spatial Data Analytics Group at HeiGIT have ohsome news to share: From now on, you can send your requests to our global ohsome API instance. So far, we’ve had a public instance for Nepal and Germany, but now you can analyse OSM’s history globally. Additionally to the API, we also have a global dashboard instance. 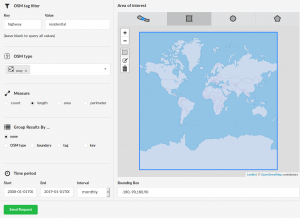 You choose any country, or region (or everything) select your measure of choice (count, length, area, perimeter), a time period and your grouping mode of choice (type, boundary, tag, key). Then you can fire your request against the underlying global ohsome API. This blog post gives you a bit more information on the usage of the dashboard. The following screenshot shows a global request in the dashboard, where the length of roads having the highway=residential tag is computed in a time span of 11 years for a monthly interval. It takes less than a minute to compute the result and display the diagram. Another example uses a newly implemented feature, where results are grouped by the selected boundaries, in this example five countries in Europe. It uses the same measure (length), key, value and time parameters. You want to visualize the development of your region? Look at the attributive completeness of two regions of your choice? Compare the tag usage of city-x in Africa with city-y in South-America? Just ask our global ohsome API instance these questions using the respective resources and parameters and it will be happy to provide you with the requested data. And it will do that for any region on the world, because you know, global analysis are (see title). And because they are awesome too, we’ve recently had a revival of a former project that generates global maps, now also via using the ohsome framework. Check out ohsomeHeX for an early preview for a first set of selected tags. For further inquiries, feedback, etc. we are reachable under info@heigit.org. Stay ohsome!